What to do in Paris in the evening after you have enjoyed a full day of sightseeing, museum hopping, enrichment classes, shopping till you dropped or intense business meetings is one of the biggest dilemmas for the solo traveler. Where do I want to dine? Do I feel like going to the the theater or being entertained in some way? And then again, should I should just go back to my hotel, watch TV and go to bed early? These common questions beg for a suitable answer. From my many years of solo travel and now as a luxury travel blogger, I am happy to share one of my favorite after hours activities that I have come to greatly enjoy, is going solo to the best lounges in major cities all over the world. During my last trip to Paris in late November, 2017, I made it a point to have a cocktail, glass of French wine or champagne at five of the most luxurious lounges in the world, each equality wonderful and distinctive. Before I elaborate on this top five list, I would like to communicate some personal background information. Briefly, I was raised in a family where both of my parents did not drink. In fact my parent's attitude was enjoying alcohol in any form was an expensive, dangerous habit to be avoided. Consequently, I was one of the rare American high school and college students that didn't drink. Being highly social, I was lucky I had a fun-filled adolescence without alcohol. My attitude changed dramatically when I met and married my husband who was a sophisticated architect who at the time was just starting to build his professional practice. During our courtship and beyond we traveled extensively. One of the things my husband loved to do was have a cocktail in the best lounge in the city where ever we were which was usually in our hotel because he also had an affinity for staying in the best hotels. Bottomline: He carried me over the threshold of my bar/alcohol prejudice and fear. His influence of having a wonderful drink or glass of wine in an elegant lounge before retiring for the day changed my attitude completely. Some of you reading this blog might still be thinking, going to a lounge solo in a foreign place isn't that asking for potential trouble? What I have observed is since the early 2000's more and more women are traveling solo for work or pleasure. Women are modern, independent thinkers and have the financial means to do what they choose. With this women empowerment, the bar scene has changed. Now you see groups of women, as well as, solo women being comfortable in a lounge and the stigma of the unaccompanied woman(en) looking for a rendezvous is not a given. A woman's attitude is key to whether she is approachable or not. My idea of a pleasant hour or two in a luxury lounge is to relax in solitude, catch up what has transpired at home via my Smartphone, strike up a conversation with interesting people or just people watch. I must say I have never had a bad experience in a luxury lounge because the places where I am comfortable are extremely well-managed. These lounges pay extra attention to solos and make sure no one is being a nuisance. Travel Tip: Solos should chose their lounge selections wisely when traveling by only patronizing to the "best" lounges, preferably those in the city's most expensive hotels. Now for my list of the Top 5 Luxury Lounges in Paris for the solo traveler and a little bit about what makes each one so special, plus, some of my personal observations. 8) Have "good" energy; a relaxed, comfortable ambiance. One common denominator all of the five lounges I am highlighting is they are all located in an iconic, five star Parisian hotel, two of which are in palace hotels, a designation higher than five star that is given by the French Ministry of Tourism. Palace hotels are the creme de la creme of Paris where no detail is too small. 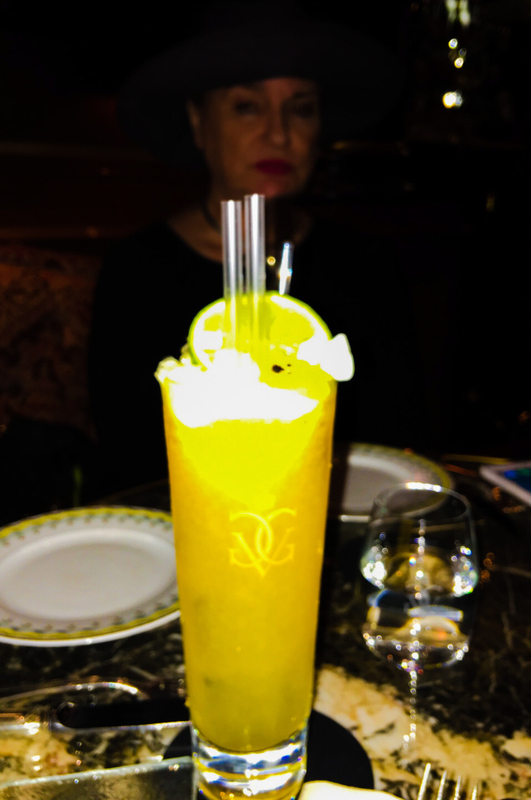 The George V Bar, in the palace designated George V Hotel, was the first luxury lounge I visited on my recent trip. After a long, tiring but highly successful shopping day on the Avenue Montaigne, I decided I needed something light to eat and an alcoholic libation before I walked back two miles to my hotel on the Rue di Rivoli. Noted for it's exquisite flower arrangements and seasonal decorations, I was, likewise, curious to see how the George V Hotel would be decorated for Christmas. A profusion of red roses artfully interspersed among the huge galactic like, silver animal and Christmas tree displays were stunning. Because I was not a guest at the hotel and didn't have a reservation, I had to wait a half an hour to secure a place in the bar. 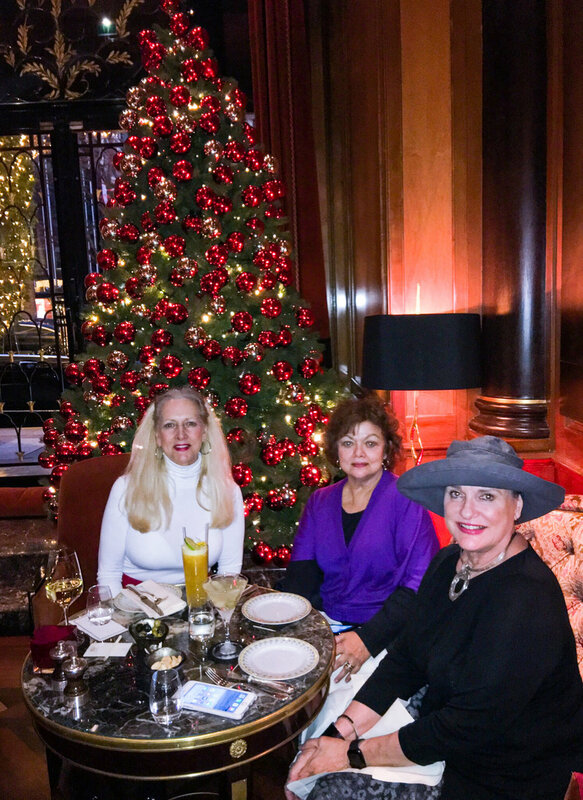 Travel Tip: Have your concierge make a reservation for you before go to the George V so you will be seated immediately or at all. 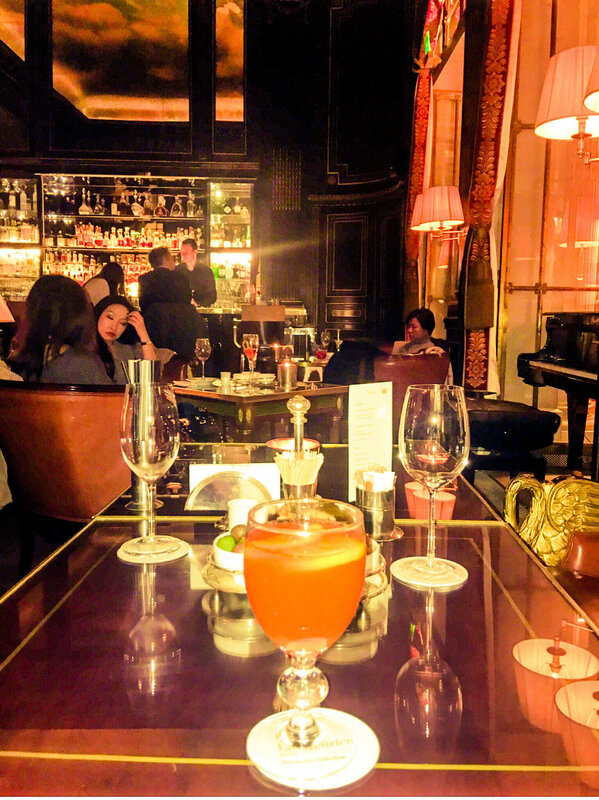 The intimate but refined interior of the George V Bar was warm, comfortable and inviting. 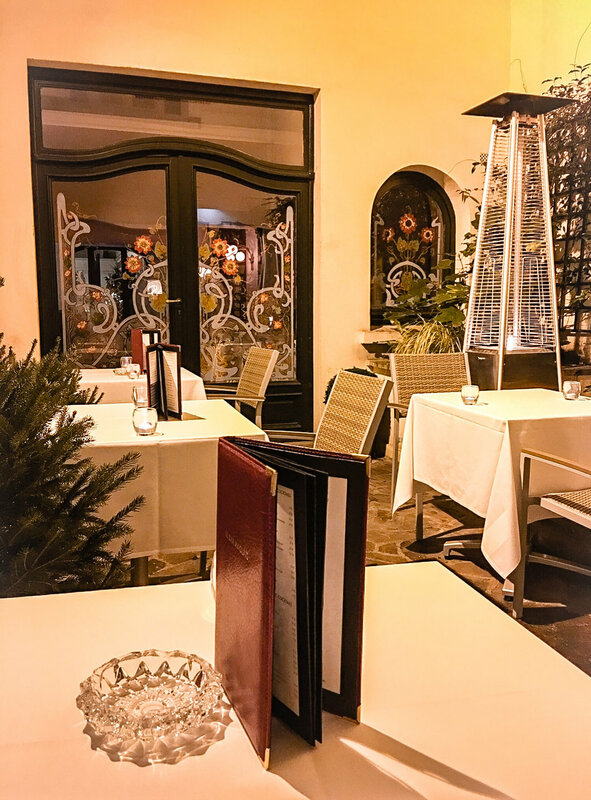 I was seated in front of the fireplace at the far end of the room next to the window which turned out to be a wonderful spot for privacy and people watching. The wood paneled room had the feel of an elegant library which was interspersed with settees, chairs and petite tables artfully arranged to accommodate the ever changing, sophisticated clientele. The bar was small with no more than ten stools for extra seating. Directly opposite of the bar was a glass enclosed bookcase filled with bottles of rare cognac, something the George V is noted for serving. One of the most distinctive objects in the bar is the handsome oil painting of King George V that hangs over the fireplace. His presence sets the regal tone for the popular Parisian lounge. Filled with locals and tourist alike, I waited patiently for the waiter to ask me for my order. Because it was dinner time, I decided I needed something to eat along with my cocktail. As I perused the light plate menu, the George V club sandwich caught my fancy. Not knowing what cocktail would be best paired with the sandwich, I asked the waiter for his recommendation. He suggested the Jailbreak, a drink made with Bombay Sapphire Gin, Chambord, fresh lime juice, ginger ale and fresh mint. George Hazac, the head barman at the GeorgeV Bar is famous for the perfect pour in which he serves his cocktails in special glasses designed specifically for the drinks served in this bar. The long glass is a tall cocktail glass with the perfect amount of ounces for a tall drink according to Mr. Hazac. One cocktail will get you started; two, will have you feeling fine and three, will begin to put you under the table! The club sandwich was more than ample with some of the best bacon I have ever tasted weaved in between the three slices of toast. The Jailbreak cocktail was compellingly delicious leading me to have two. After a hour and a half, I was totally relaxed and in a upbeat, mellow mood. The cocktails and the sandwich had hit the spot, as my father used to say. The well-dressed, attractive waiter brought me my check and for a split second I had to do a double take, $125 for two drinks, a club sandwich and the included service charge. Wow, the bill really hit the pocketbook spot! After the initial price shock subsided, I thought to myself, You only live once. My entire day spent on the Avenue Montaigne shopping had been grand and this was a perfect ending to a perfect but costly day. Bottomline: Be prepared, the best lounges in Paris are extremely expensive but the experience is worth the expense. As you enter the formal Empire style, wood paneled room of the Le Bar 228 you are immediately struck by the three large fresco paintings on the wall depicting party scenes of a bygone era at the Chateau Fontainebleau which are original to the bar when the hotel first opened in 1937 and when it was called the Fontainebleau Bar. Dim lighting and soft live piano music give this highly refined room which is outfitted with leather couches and chairs a comfortable and inviting ambiance. High society without the pretension, a place where a solo traveler could be quite happy to have a drink or two in. Like four of the five luxury lounges I will be highlighting in this blog post, Le Bar 228 has a famous Head Barman, William Oliveri, who has been there since 1978. Wow, 40 years! Mr. Oliveri is famous for creating the Best Bellini in the World and has the personal, professional goal for the customer to wish to return. His tuxedo clad staff is skillfully attentive to the highly discriminating clientele of the Le Bar 228. Everything is quite smooth and sophisticated in the Le Bar 228. Even though I wasn't a VIP, I was treated like one. Many times a solo traveler visiting a lounge will be asked to be seated at the bar so not to partially fill a table, something I never agree to. Placed at a small, corner table, I decided to order a glass of French Cabernet Sauvignon. Not knowing which wine by the glass to order, I asked the waiter to make my selection. For an hour I relaxed and enjoyed the bar snacks, two wonderful glasses of wine and the soothing ambiance of the regal Le Bar 228. 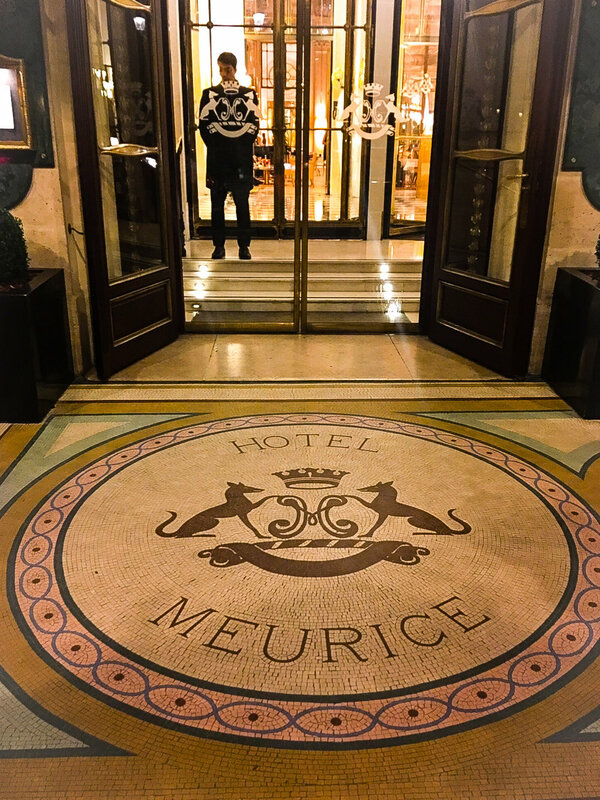 Feeling blessed to be alive and having made it to the famous lounge at the Le Meurice, I reflected, "it doesn't get any better than this!" Before I review the next lounge I need to mention that if you are hungry the Le Bar 228 has a menu that offers fabulous salads, gourmet sandwiches and other light plate dishes. Likewise, if you are in the mood for something sweet, you are in for a special treat. All the desserts for the Le Meurice Hotel are created by Cedric Grolet, the winner of the "Best Pastry Chef in the World 2017" award. As you can imagine, my two glasses of wine were costly, $50 per glass, but to be at one of the centers of Parisian glamour I found it somewhat affordable for the entire experience. 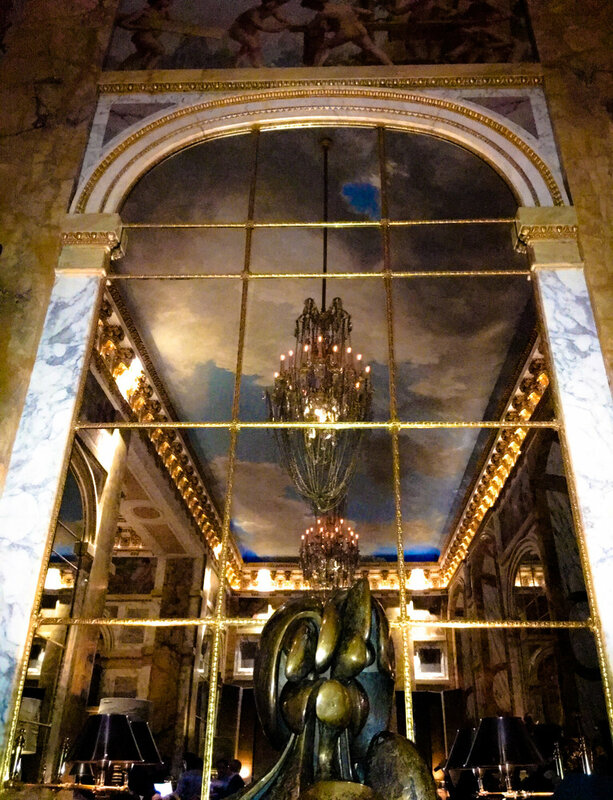 Someone once described the Le Bar 228, "as the essence and beauty of French culture, Pure Paris!" Yes, Mr. Olivieri, I hope to return one day and when I do, I will order your famous Bellini. After a delightful, afternoon Coco Chanel walking tour which ended at the Hotel Ritz, Mademoiselle Chanel's home for many years located at Place Vendome, I made a return visit to the Bar Hemingway, one of the most famous bars in the world. My first time in this lounge was with my son, Andrew, some fifteen years ago. It was his first trip to Paris and I was taking him to places I thought he would enjoy, not just forcing him to visit museums and go shopping with me. We had a memorable evening at the iconic Bar Hemingway with Andrew drinking Chevas and Coke and me consuming a couple of Martini's while pairing our drinks with an order of sliders. My son still nostalgically talks about our special time at the Bar Hemingway. 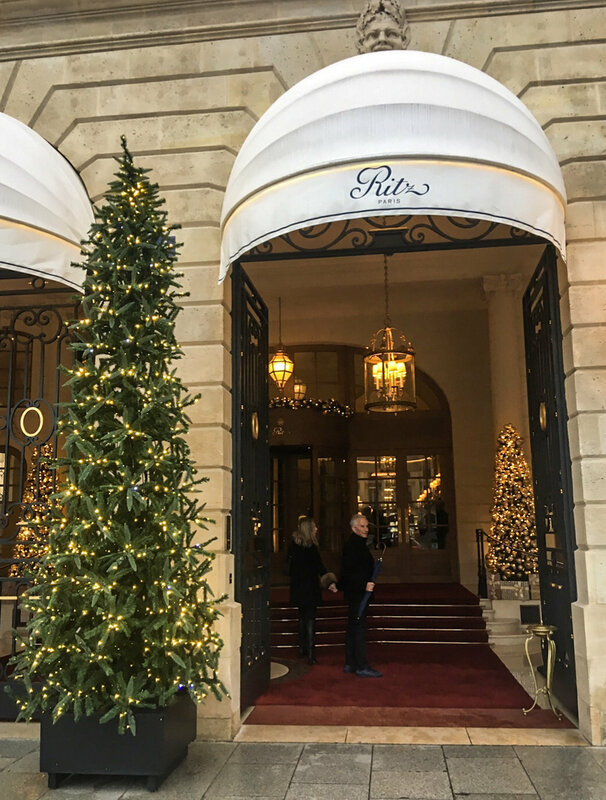 The Hotel Ritz had just been re-opened six months after being closed for a four year, $450 million dollar renovation when I was there last November. I was extremely curious to see if the Bar Hemingway had been radically changed during the renovation because it had always been considered to be a museum bar because of the historic memorabilia it housed belonging to Hemingway, F Scott Fitzgerald and other famous writers, composers and intellectuals that frequented this Parisian lounge and help create its special mystique. As I approached the bar I was a little anxious about what I might find but when I entered the small, familiar, multi-level area, there it was virtually unchanged with its wood paneled walls, the many historic photos of Hemingway and others still hung among game and sea animal trophy heads, the antique phonograph and typewriter, likewise, in the same place they were in the first time I was there. This bar is not what I call luxurious but it definitely has a mystique which you feel the minute you walk in. A warm, comfortable environment that a solo traveler will feel right at home in while enjoying his or her favorite alcoholic beverage. One of the biggest, continuous attractions of the Bar Hemingway is its Head Barman, Colin Field who has been touted as the World's Best Bartender. Mr. Field has been with the Hotel Ritz since 1994 and his reputation and professionalism is legendary. Having studied literature during his college years, in mid-stream, he decided he had a passion for bartending leading him to become a celebrity bartender. I find it an ironic coincidence that a former literature major would be a world famous bartender in Hemingway's favorite watering hole!! Colin Field is loved and respected for many reasons. First, he prides himself in knowing everything about what makes every one of the liqueurs, wines, champagnes, cognacs, ports, beers so good. Where the grapes or food ingredients are grown, the soil quality, the amount of rainfall in any given year, everything and anything that would make a year a good, average or bad one. New products, new drink treatments and new ways of creating innovative cocktails are topics Mr. Field keeps constantly abreast of making him somewhat of an alcohol scientist. Even more than his encyclopedic knowledge of the spirits world, Colin Field is famous for his compelling personality and his personal service philosophies that he adheres to when pleasing his clients. Mr. Field believes, " A person doesn't come into a bar because he is thirsty. He comes into a bar to relax with a wonderful drink." He is famous for creating the perfect drink for his customers with many requesting that Mr. Field decide what they should order. Loving your clients and loving what you do is another bartending philosophy he lives by which makes him so popular. Many people come to the Bar Hemingway just to have him serve them not because it's such a historic bar in one of the most luxurious hotels in the world. Preparing each drink with the utmost care is critically important to Mr. Field. He believes, "the more respect you put into a cocktail when making it , the better the cocktail." His signature or most popular drink is the Serendipity or as he refers to it as, France in a glass. This delicious libation is made of Calvados, apple juice, champagne and mint shaken over ice and poured. Two other noteworthy drinks he takes credit for is the Vodkatini, the "driest Martini in the world" and the world's most expensive cocktail, the Ritz Sidecar priced at $1,750 for one, which he had entered into the Guinness Book of Records. When in Paris if you are looking for the world's most famous bartender to make you a specialty drink that will be memorable in an intimate, historic setting head to the Bar Hemingway. It can't be topped for authenticity and quality of the lounge experience. The fourth recommendation on my Best Luxury Lounges in Paris list is the Le bar les Ambassadeurs in the Hôtel de Crillon Hotel located at the Place de la Concorde. This fabulous hotel is owned by an ultra wealthy Saudi prince and is known as the, Queen of Paris. Like the Hotel Ritz, the Hôtel de Crillon was, also, updated and renovated to the tune of $150 million dollars reopening after several years once again in 2017. The theme for the renovations was "history with a modern twist and luxury without ostentation." 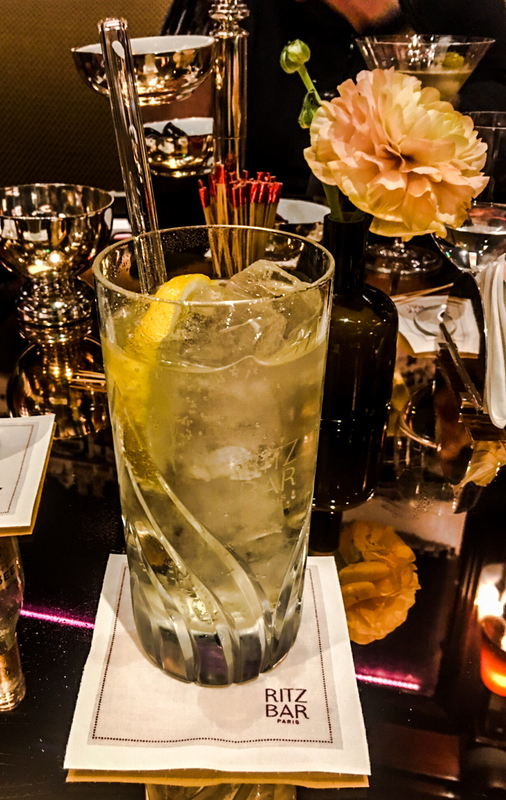 Out of the five luxury lounges I am highlighting, the Le bar les Ambassadeurs has the most modern, jetsetter essence. The large, majestic room has old bones with soaring, solid marble walls, a gorgeous cloud painted ceiling, massive chandeliers and a stunning contemporary piece of sculpture as one of the room's focal points. The furnishings are, likewise, more modern and up-to-date featuring low, free flowing couches and chairs covered in 1000 thread count Japanese, beige fabric. Classic, cool, sophisticated interiors set the right environment for the highly mixed international crowd that congregate at the Le bar les Ambassadeurs. The sophisticated atmosphere was enhanced by a wonderful, young female singer who was accompanied by a jazz pianist singing a medley of contemporary romantic songs. Even the Head Barman, Yann Daniel was young being in his mid-thirties which is quite unusual for a position of this importance. Rare champagnes and the finest caviars are some of the offerings the lounge is known for. Not being in the mood for champagne, I selected a glass of white, French Burgundy wine. Ooh la la! The wine was crisp, fresh and delicious, a perfect night cap before I headed back to my hotel which was only a few blocks away along the Rue di Rivoli. Satisfied and relaxed, I lingered, listened to the sultry singer and people watched for over an hour in the chic chic Le bar les Ambassadeurs. Another night in Paris among beautiful people was a nice ending to my last day in the City of Lights. 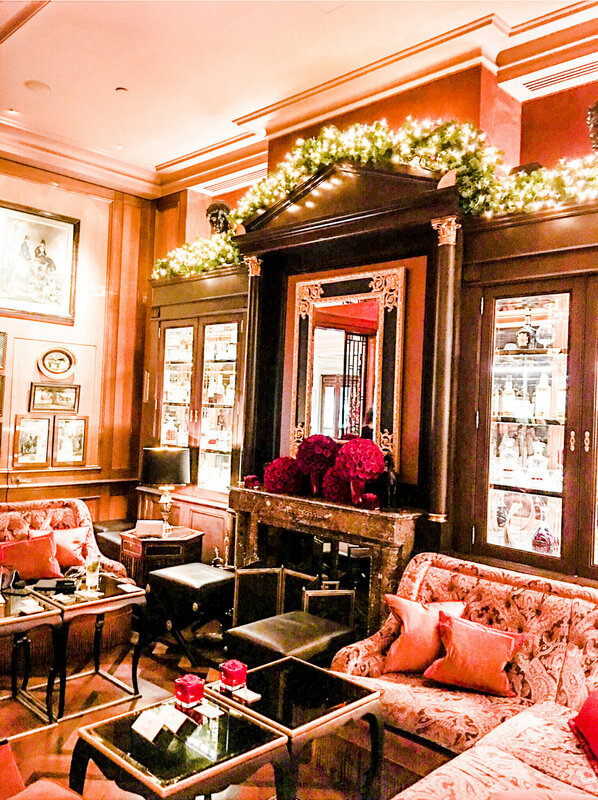 Though not as famous as the other four luxury lounges I have reviewed in this blog post, the English Bar in the historic, Hotel Regina, my hotel for my most recent stay in Paris, definitely makes the top five list. Of the five, the English Bar is by far the smallest but small doesn't mean less desirable. Quintessential Parisian is how I would describe this gem of a lounge. The beautifully appointed room was decorated with an assortment of deep red velvet covered, French settees and chairs, antique oriental rugs gracing the marble floors, Art Nouveau etched glass works intermeshed in the solid oak paneled walls and the indirect lighting make this bar an elegant setting for drinks and conversation. I felt like a French aristocrat when I was having a glass of champagne or a cup of tea here. Intimate and sophisticated, this is a place where locals, as well as, the hotel guests patronized for relaxation. You know a hotel bar is exceptional when locals are in there having drinks and enjoying the company of friends. To my knowledge, the Head Barman was not a noted professional but, nightly, I found him to be highly attentive. The several evenings when I ended my day in the English Bar were lovely. Comfortably, I enjoyed a glass of wine or two, perused my Smartphone updates and/or wrote in my journal cataloguing my thoughts, personal observations and my days activities. No matter how long I stayed in the English Bar, the bartender made sure I was well taken care of. An excellent French wine and champagne list highlight the bar's libation menu. Small plates were also available if you want something to eat. Last, if you want to enjoy a cigarette or a cigar with your drink there is a beautiful, petite terrace directly next to the bar where you can smoke. I will end this rather lengthy blog post with a focus on the French philosophy, joie de vivre or the thought life is made to be enjoyed. To live in and visit Paris is to enjoy each day. So when you treat yourself to a specialty cocktail, a glass of fine French wine or champagne in an elegant, luxury lounge, you experience what the French pride themselves in, the Art of Living. Consequently, I encourage people who are traveling solo to Paris not to avoid patronizing a sophisticated bar but to pick a great one or stay in a fabulous hotel that has a wonderful lounge. Don't let your fear or feeling alone stop you if you want to go to a luxury lounge solo. The solo stigma is gone in Paris. Most everyone in these wonderful libation temples are there to celebrate their day and to celebrate life. 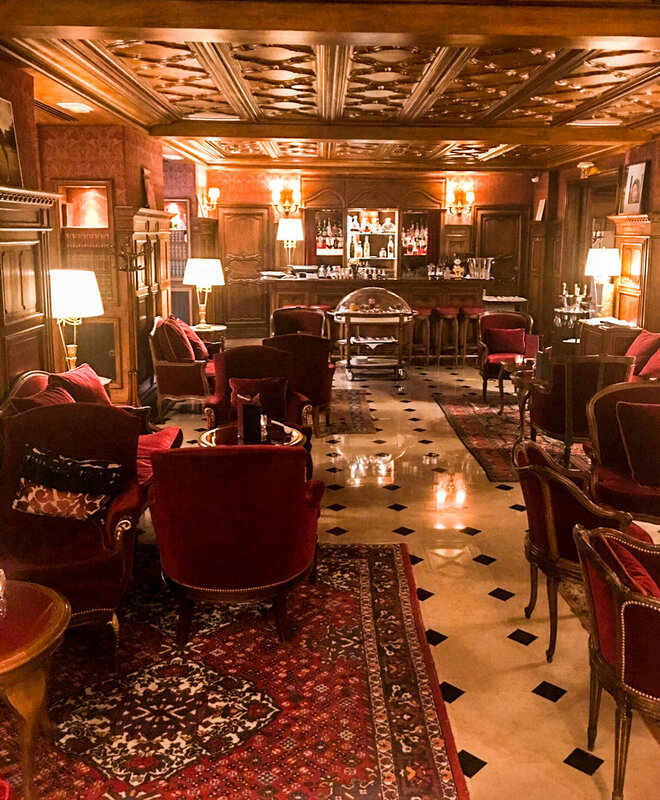 When in Paris solo treat yourself to a drink in one of these celebrated lounges! If you enjoyed this post, let us know in the comments section below and share with someone who might enjoy it as well. For more affordable luxury solo travel tips, tricks, stories and advice, follow us on social media and listen to the Solo Travel Talk Podcast! Click on the links below! Looking to be inspired by fashion? Travel to Paris and spend a day along the Avenue Montaigne, one of the most fabulous shopping streets in the world. For solo travelers visiting the "City of Lights" enjoy this blog highlighting my personal Paris makeover and the memorable day I enjoyed on the Avenue Montaigne. Experiencing Paris as a solo traveler is delightful but key to a great trip is to know what “must do” things you should focus on. A River Seine dinner cruise, padlocks of love, "magical" beaches that appear for the summer... The Seine has history and spectacular sights that are the soul of the City of Lights. On my new solo travel podcast, I investigate the Seine, plus share how to balance "touristy" activities with authentic experiences. Looking for the “best of the best” when traveling alone in Paris. Refinement, luxury, opulence--all this and more can be found on Avenue Montaigne in Paris. 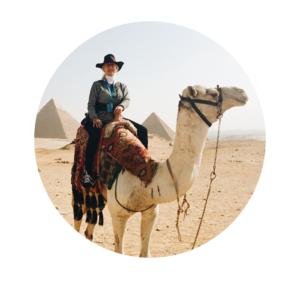 On the new episode of my solo travel podcast, Solo Travel Talk, I take you to this fabulous destination and share why it should be on the solo traveler's itinerary. When in Paris, treat yourself to a great craft cocktail or a glass of fine French wine at one of the most elegant lounges in the world. Click here to read my list of the Top 5 Best Luxury Lounges in the City of Light. These are places I feel like I can relax as a solo traveler without a worry in the world! A votre sante! When traveling solo enjoy the elegance and sophistication of Paris that can be found in the superbly managed bars and lounges of the City of Lights. I take you on a tour of five not-to-be-missed after hours establishments well suited for the solo traveler on the new episode of my solo travel podcast, Solo Travel Talk. Looking for a five star hotel in Paris that is affordable? 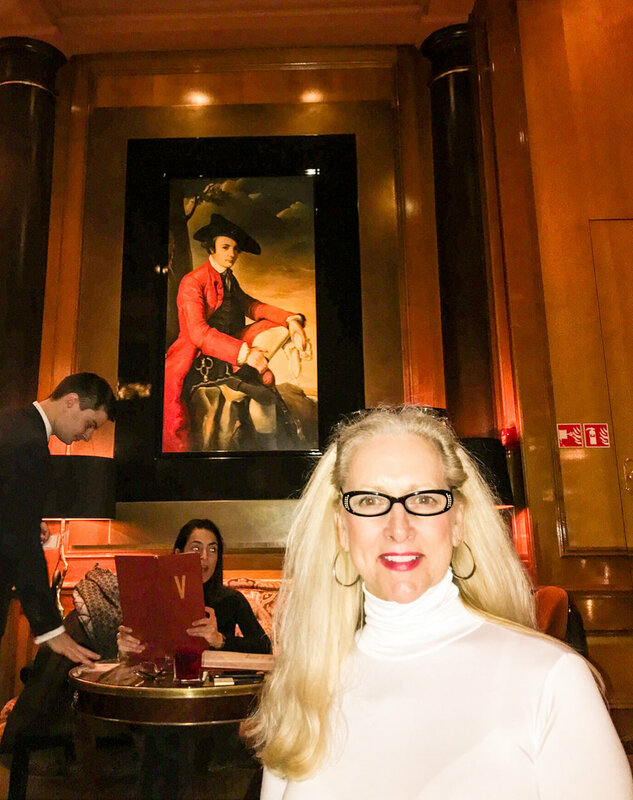 Listen to this episode of my solo travel podcast, Solo Travel Talk, and be transported to Paris and discover the Hotel Regina where I profile this gem of a hotel plus explore affordable luxury and how solo travelers can get more luxury for less when traveling the world alone. Most successful solo travel trips have a focus. I created a fashion and a Lady’s theme for my recent trip to Paris, and you can, too! Hear all about my Style and Fashion focused trip on my new solo travel podcast episode, and get inspired to craft your own themed Paris visit. When traveling to Paris solo it is important you plan your trip well so your adventure alone will be a good one.Listen to the new episode of my solo travel podcast, Solo Travel Talk, and be swept away what you should do on a solo trip to the City of Lights. Get my best Paris tips and find out why I think Paris is perfect for solo travelers.